Winter has finally come and I found myself needing a hat for exceptionally bad weather. My wife had sewn a trapper hat of her own that I thought was great, but did not fit my extra-large hat size. She had the pattern and some scraps of rather expensive fabric laying around, so I decided to take a stab at it. The pattern I used came from this tutorial. As you can see from the pieces it's not exceptionally challenging. The "cut on fold" means to cut two layers of fabric and the marked edge is the fold. I had to add about 1/4" to each side of the "Hat Side" piece (total 1" circumference) and 1" to the height of the Hat Side and Hat Top piece to fit me. If you knew what you were doing, you could probably finish this hat in 2-3 hours. I do not know what I'm doing, so it took longer than that. I used the Harris tweed for the lining of the upper interior plus a layer of Thinsulate. The fur goes on the inside of the ear flaps plus the forehead flap. The cast iron plate on the left side is a pattern weight which prevents the paper from moving around as you're marking chalk on the fabric. First step is to sew the two "domes." The long rectangle piece goes in the middle and you have to manhandle the two arches pinned along the length. I start with the two corners, then the exact middle, then fill the rest trying to keep the two parts flat to each other. "Always sew good side to good side" really helped me keep the order of operations straight. Try to envision how the seams will look when flipped inside out to make sure you, for example, attach the ear flaps on the correct side of the domes (ask me how I know). Pictured are the two hat layers before the final assembly. Generally these trapper hats have some kind of attachment to tie them flaps down or up. I had some scrap leather laying around so I dyed it chocolate brown and hand sewed a loop to the inside of the ear flap. Final assembly was a little tricky; you have to sew the two parts together inside-out. I left the backside of one ear flap unsewn so you can manhandle the whole hat through it. The last step is to hand sew a blind stitch to cover the hole and you're done. Rather than describe it I embedded a video below. The next day we had a snowstorm and there was plenty of snow blowing and shoveling to do. I can say the hat worked wonderfully; it's probably the warmest that I own (too warm, in fact, for working in 20F+). The material I used were expensive scrap left over from my wife's other projects, but there's no reason this could not be done significantly cheaper. The Thinsulate is inexpensive and I think adds a great deal of warmth, so I would not skip that. This was my first real attempt at apparel sewing, so if you're on the fence I can manage it, you can too. Tony from SteampunkMasks got in contact with me after my plague doctor mask project and asked if I'd like to try a second project. I liked his "respirator" steam punk masks and decided to try one. This turned out being an easy build. Even without a laser cutter would not take long to prep the pieces and it looks great when it's finished. I managed to fit all the pieces, including the straps, on a single 14"x12" sheet of 6oz leather. If you were cutting this out by hand and did not want to buy a larger sheet, you can get by with two 8.5x11" sheets of 5oz leather from Tandy. If you have access to a laser cutter, it's good to test on scrap pieces to find the right frequency/speed/frequency. The trick is to not burn too much of the leather yet get all the way through (especially on stitching holes). If you want to remove the char from the edges, some Fast Orange and a toothbrush takes it right off. While laser cutting is certainly cool and speeds up the project, this entire process could also be accomplished with a box cutter, leather punch and a hammer. The pattern comes as a PDF so you would print it out, cut out the pieces and then trace on the leather with light pencil marks. If you wanted to improve the appears of the mask, you can still bevel and slick the edges, but I chose not to. The pattern has no real instructions but by looking at the example it's clear how the parts come together. 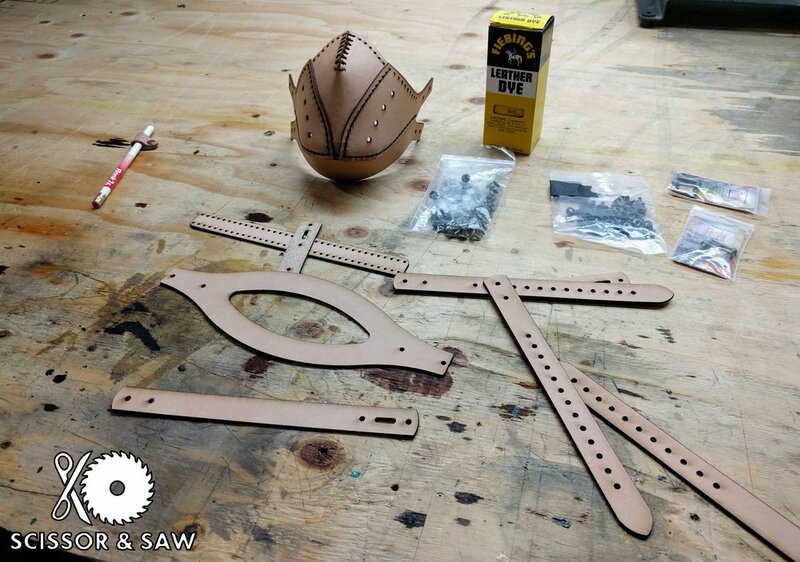 This project calls for three, 3/4" buckles, eight 3/16" eyelets and rivets for the strap system. If you are cutting it out by hand you could easily just box stitch some of the mounting points near the mask. When doing the top cover, it's important to have soaked the leather in warm water to get it pliable. If you try to force it you can crack the dry leather. The eyelets on the front are aesthetic since there is more than enough gap at the edges of the mask to breathe comfortably. I liked the red dyed version in one of Tony's example photos so I simply replicated it. The dye took several coats before it got dark enough to not appear pink. The soft side in the photo shows what the first few coats looked like and the mask shows what several heavy coats turns into. Since there is no historical basis for this piece a more radical color does not look that out of place. The Fiebing's alcohol-based red dye dries very fast so it could be completed in a single evening. I've learned that if there will be lots of tight curves on a piece and you're using alcohol dye to apply it after primary assembly. This avoid cracking or fighting the leather too much when you're trying to manhandle it into place. Finally, I rubbed in a heavy application of neatsfoot oil to re-soften and protect the leather. This has the side benefit of helping darken it further. The straps were very long in the pattern so you may want to trim them down. I wear a large helmet size and I am still only using the fifth hole on the strap. I chose to make a small keeper out of scrap in case I wanted to put it over some kind of hat, but if you intend to wear hats or hoods over it I'd shorten them. I am not sure what kind of costume this goes with but I'll probably combine it with some military surplus. The mask itself could probably be thermoformed out of Kydex with a heat gun which would be its own interesting take. By deleting the eyelet and changing the holes, you could also easily integrate something like piping or tubes coming out. In 1619, Charles de L'Orme invented the Medieval equivalent of a hazmat suit. It consisted of a waxed overcoat, leather gloves, cane and beak-shaped mask filled with floral scents. Even though the miasma theory of disease was ultimately proven untrue, the beak functioned like a gas mask so plague doctors could treat Bubonic Plague victims. I have always thought that the beak / Plague doctor masks were fascinating, but could never justify buying one from a custom maker. With Halloween coming up, what better time to make one myself? I am not aware of any surviving examples of the costume and it's not clear how widespread they were. The 17th century copper plate engraving to the right is the most common image we have. It was originally printed in 1921 in Die Karikatur und Satire in der Medizin. I am skeptical about how consistent the masks were between doctors and regions. They were likely custom, one-off products of roughly the same shape. In the absence of more information, we are forced to make our own creative choices. niteKore has a tutorial showing how to assemble the digital pattern he sells. It consists of three primary faces (left, right, bottom) plus straps and reinforcement pieces. On both his mask and mine, we used laser cut acrylic for the lenses. Mercifully, the digital pattern was vector files that I could modify for use in the laser cutter. I rearranged the objects onto a single 12"x24" pattern (the size of the cutting bed) and cut it out of tag-board. Before I went and built the entire leather mask, I wanted to check its fit. Simply taping the pieces together, I found that it was perfect as is and required no scaling. Next I purchased a sheet of 6 oz. leather from Tandy and cut out a 12"x24" piece. Using some scrap, I dialed in the settings on the laser cutter and then ran the entire pattern. The shadowing burns from the laser cutter do not smell great, but eventually it dissipates. It can be avoided by pre-moistening the leather, but since the mask was going to be dyed a dark mahogany I just let it go. The dark acrylic looks opaque from here, but is actually relatively clear from inside. While the pieces were separated, I applied several coats of a Fiebings alcohol-based dye. Unlike the oil-based I had been using, the pieces became quite rigid and there were some small cracks when I assembled it. For serious bends, wetting the leather before sewing is necessary to avoid breaks. Next I set the 1/4" eyelets for the air holes on the top and bottom of the beak. I am not sure how necessary they are since most of the breathing air comes from the edge of the mask, but I think they look nice. Before sewing, I treated all of the pieces with heavy coats of neatsfoot oil to restore some of the pliability. Because the dye had dried out the leather, it took quite a bit of manhandling and dampening to bring the seams together without breaking. The laser cut stitching holes were generously sized which made doubling back the saddle stitch on stressed points much easier. I had antiqued rivets on hand for the strap attachment points, but had to enlarge the holes slightly. Instead of laser cutting the straps, I used slightly larger 1" strapping I had on hand. Using my paper mask, I cut and taped the paper straps to an appropriate length. I then removed the paper and cut the leather to length using it as a pattern. With the straps in place, I tightened it to size and marked my first strap hole. From there I spaced holes 1 cm apart. To finish, I applied a few more heavy treatments of neatsfoot oil and stuffed the mask with rags while it dried. Its surprisingly not uncomfortable to wear. The gaps around the mask edge provide plenty of air and the lens only fog up slightly. Maybe not great for keeping out bad vapors, but good enough for a costume party. I recently was given a Leatherman Wave as a gift and it has been part of my EDC for a few months. The nylon MOLLE case that it comes with is perfectly functional, but it protrudes from my belt more than I like and Velcro is not my favorite fastener system. I liked the belt slots from the laser cut holster project, so I decided to make something similar for the multitool. I swung by Tandy and picked up an 8.5 x 11" sheet of 4-5 oz leather. Divided in half, it provides enough material for the entire project. Ian Atkinson has a fantastic leatherworking channel that I used as reference. Below is the video that demonstrates the wet forming process I used to make the front of the case. My system, however, is not nearly as pretty but it is functional. Were I to make more than one, Jimmy DiResta has a good method using wood forms. Had I planned out the case better, I would have more intelligently placed the tension nails. As it is, I managed to cut around them but that was pure luck. For future designs, sketching it out on leather should be the first step. After the wet forming, I secured the back using contact cement so it would not shift on me while punching stitching holes. If you're wondering, the wood putty was just there to provide an arc to trace for the flap. The most difficult sections to cut out were the belt slots. Using a drill bit of the same diameter, I drilled out the ends and used a box cutter to remove the sides. It's important to only cut half-way in either direction so the knife does not cut beyond the ends of the drilled holes and leave ugly nicks. After removing the excess, I stitched around the tool first so that it would not lose any tension. The process is the same as from the laser cut holster. Around the edge, I used a stitching groover to provide a channel for the thread and punched the holes by hand. The snap is from a cheap kit that included the anvil and setter. If you have never used one before it would be smart to try a few on scrap. Peening the posts evenly takes some practice and removing a failed one is challenging. After stitching, I used an edge beveler (the same as the stitch groover), a slicking wheel and a spoon to burnish the edges. I used to have the slicking wheel on a drill press but I've found that its not significantly faster and more likely to burn the leather. Patience really does produce the best results here. I still struggle with getting dye applied evenly. In the picture below it looks worse than it normally does because of the harsh direct light, but as you can see the ridges and bent portions are the most difficult to dye evenly. I applied three coats in progressively heavier applications, but my technique obvious needs work. To finish it off I applied neetsfoot oil to prevent cracking while it breaks in. Despite the dye and mild asymmetry, I'm very happy with the finished product. The tool rides much closer to my body and the retention on the tool even without the flap is great. Like the Leatherman, I intend to wear this for years and I'm looking forward to seeing how it holds up. Unfortunately I don't have any progress pictures, but this is my modified Cold Steel Trail Hawk. Out of the box it's actually pretty nice, especially for the price. I bought it as a lightweight hiking companion that serves the role of a hatchet. The poll is useful for putting in stakes and the edged face can process wood around the sizes you would use for a small cooking fire. The stock version includes a set screw to secure the head to the handle. The swell at the end secures the head while being swung, but having a screw prevents handle replacement in the field, so I removed it. The handle has a clear coat on it that is a little slick and probably would give you blisters if you used it long enough. I sanded it off and put a few coats of boiled linseed oil. There is nothing wrong with the paint on the head but I wanted a more traditional "forged" look. I sanded off the paint and soaked the head for a few days in vinegar, periodically removing it and rubbing off the excess buildup. Last I built a new sheath. Cold Steel offers a nylon version that only covers the edge, but in my experience the rivets tend to rust over time. I sketched a pattern on paper for fit and transferred it to 8 ounce leather. Once riveted, I treated it with Fiebing's black dye, carnauba wax, and neatsfoot oil. Since this will be carried on the side of a pack it did not need a belt loop. I have found that the handles on tomahawks are too long to be comfortably carried like a traditional knife. I will be carrying this on a hike soon so we will see how the light waterproofing holds up.